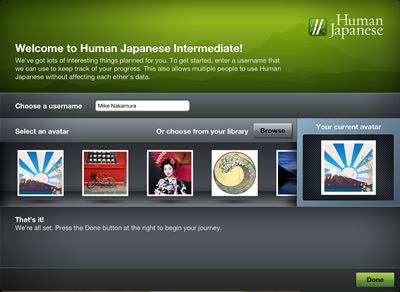 Human Japanese Intermediate is packed with content and features that will take your Japanese to the next level. 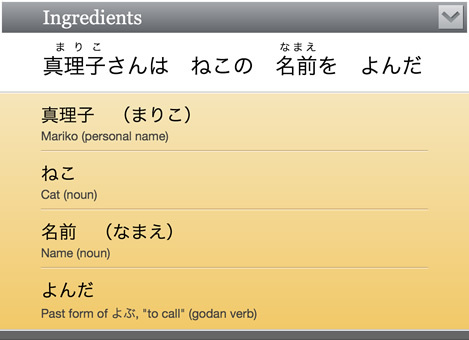 If you used the first Human Japanese, you'll find Intermediate to be a completely seamless experience. And if you've learned the basics somewhere else, we've made it easy to jump right in and continue your studies here. The friendly, down-to-earth tone you know and love is back with more than 40 chapters, 2600 example sentences, and 3900 recordings altogether. 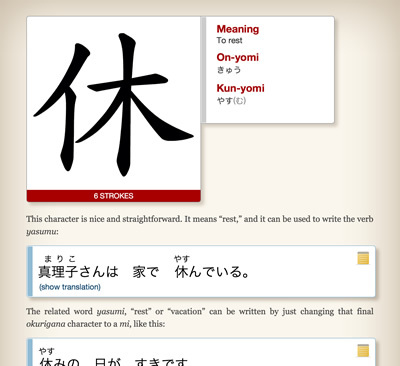 Wrap your mind around kanji in an integrated way, with animations, examples, writing tips, quizzes, and more, for every character introduced. Rather than simply throwing a bag of characters in your lap, we carefully show you how everything goes together. Momentarily forgotten that word? Not a problem. Our patent-pending Ingredients™ example sentence breakdowns provide instantaneous, simultaneous lookups of every word in every example sentence so that you never lose your flow in the middle of an interesting discussion. Stay sharp with five different kinds of intelligent quizzes that track your response history, automatically showing you questions you tend to miss more frequently. Or use the "most-missed" mode to concentrate exclusively on your trouble spots. User accounts let multiple people track their progress, experience points, and quiz response history independently. Download a free trial on the platform of your choice and take it for a spin! If you're brand new to Japanese or need a refresher, start with Human Japanese Intro. If you already understand the basics and want to go deeper, Intermediate is right for you. Need more details? Peruse the chapter lists to get a feel for the scope of content in each. If you still need help, we're happy to steer you in the right direction. Email us at support@humanjapanese.com for speedy assistance. We care deeply about helping you to grow in your understanding of Japanese. Every feature of Human Japanese Intermediate has been designed to give you the smoothest possible learning experience. Whether you've worked through the original Human Japanese app or have come from a different background, it will be our pleasure and privilege to be your guide on the next stage of your journey. 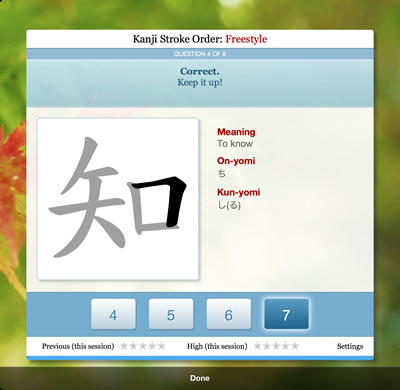 Download a free trial on the platform of your choice and try Human Japanese Intermediate today!